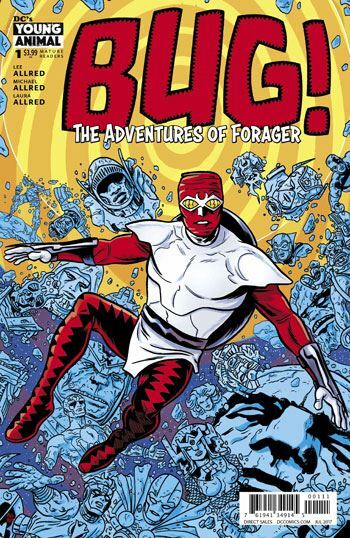 I really wasn’t expecting much from Bug – The Adventures of Forager. Out of all the News Gods characters, he had been one of the few that never really grabbed my interest. In truth, I hadn’t even recalled that the character had died in Cosmic Odyssey, until this issue recapped that. But he’s back, and better than ever. Or at least more interesting than ever. And only maybe back. It’s all a dream after all. I think. To be honest, I’m not 100% sure just what is going on in the first issue of this comic, but I also do not mind that. I loved the ride. There are a whole bunch of Allreds working together to pull off this comic. Michael, Lee and Laura. I expect they are all related. Be more fun if it was a giant coincidence. This is kind of silly review, I realize. But what the heck, Bug is a silly book. A really silly, really fun book. 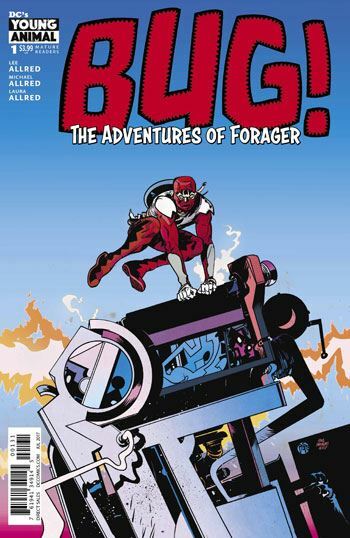 The story sees Forager emerge from a cocoon, uncertain of where he is, and whether he is really alive. There is a Mother Box circuit made of dominoes by a ghost girl and a talking teddy bear, and this leads to a great panel setting up a bunch of exciting guest stars to come. Each of which was worked on, and many created by, Jack Kirby. 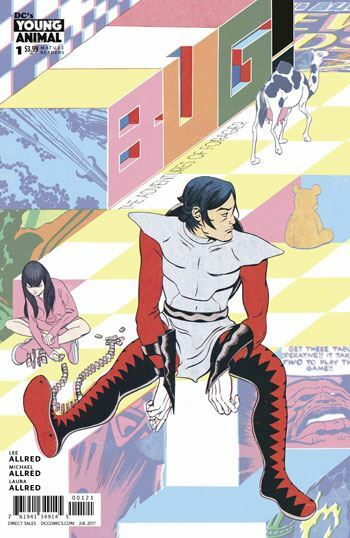 By the second half of the story we and Forager are into a wonderfully crazy adventure with the 1970s Sandman, the one from the Dream Dome, with his assistants, Brute and Glob, facing off against his old for General Electric. Perhaps this comic is not quite for everyone. Perhaps if you take no joy in life, you will not be able to revel in the wonderful madness and dive on in through the obscure characters. If so, I pity you.